Aliases include the leopard ground squirrel, squinney and striped gopher. Description: Body length of 6.75 to 12 in. long (up to 16 in. with tail). Weighs 4 to 9.5 oz. Brownish with 13 interchanging brownish and whitish longitudinal lines (back and sides). These appear as rows of whitish spots within dark lines. Both the torso and abdomen have fine tan hair. Each front foot has four toes, clawed for digging. Five toes are on each back foot. Life cycle: By early fall, the 13-lined ground squirrel establishes burrow caches of food and an anatomical layer of fat. It begins hibernation in October by entering a deep burrow, contorting its body to reduce surface area, decreasing respiration rate from approximately 150 breaths per minute to less than one breath every five minutes. It emerges from hibernation in March or April. After a gestation period of 28 days, three to 14 blind, hairless and toothless pups are born (one litter per year). Pups weigh about 0.1 oz. at birth. Stripes begin to form at about 12 days, and eyes open at about 28 days. Habitat: Urban to rural areas that include parks, golf courses, athletic fields, cemeteries, lawns and area-wide open grasslands. Food: Nuts, seeds, roots, bulbs, fruits and insects such as caterpillars, cicadas, crickets and grasshoppers. They will occasionally consume bird eggs, mice and shrews. Range: South central Canada and the central U.S. The behavioral range or territory can cover two to three acres. Behavior: They can usually be observed in parasocial groups lacking a hierarchy, hibernating solitarily or para-colonially. They are diurnally active and have good eyesight. They frequently stand upright to observe the immediate area. They can also run up to 8 mph and can swiftly change or reverse direction to evade predators. During predator threats, they try to retreat to their burrows. Burrows are within 1 to 2 ft. beneath ground level and can be up to 200 ft. long with numerous side tunnels and compartments. 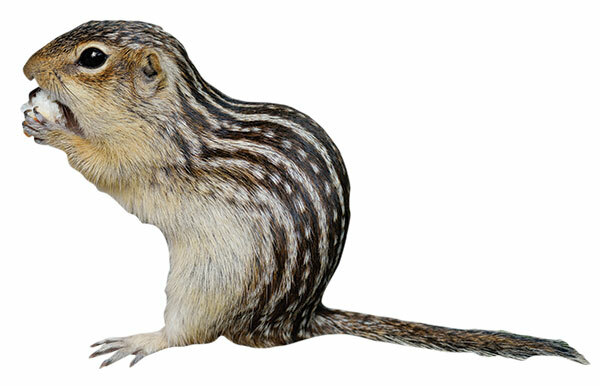 Significance: The 13-lined ground squirrel can be a reservoir and vector for fleas and ticks. Its presence is a nuisance, thanks to its ability to cause significant damage to structures and landscaping.